After a great flight across Switzerland I was no longer calculating whether I was on track to reach Monaco before the July 17th deadline – France was just around the corner. With a great weather forecast I was in a good position and things were going really well. Walking up the valley beside Lac des Dix I was approaching familiar terrain. 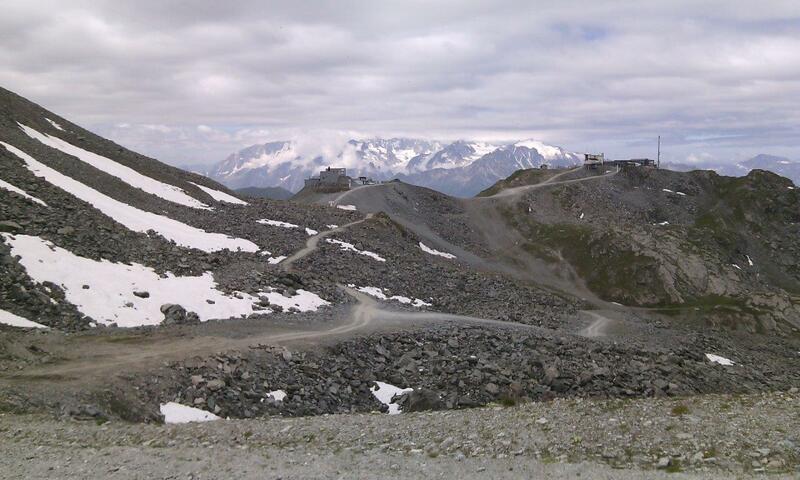 Last year I’d walked through here on the Haute Route with some mates from Oz. The skies were overcast and I was blasé about strong winds in the forecast and not surprised when the forecasted strength reduced from the previous night. Reaching the first high col, I saw Rosablanche which I climbed last year but this time I had to keep off the glaciers (without a recognized mountain guide) so there was an extra valley to cross. There was virtually no wind at the col so I had to find an appropriate snow patch to launch amongst the fields of broken angular rocks. Louis seemed anxious in his text message, warning me that other pilots were moving fast, overtaking me down in the Rhone valley. I responded before taking off – “I bet they wish they were up here!” Some lift on the ridge gave me hope – plenty of instability – but my glide west across a small valley was rather sinky. Landing on a gravel road I decided to walk up to the next pass as I was, with the glider bunched up. Reaching the top of a ski lift I asked the maintenance workers in French for water but there was none to be had so I walked to the nearest patch of grass and launched. As it so often happens, what was meant to be a long morning glide before the thermals started turned into a cross country flight. The air was buoyant initially until I crossed over to the Verbier launch where I saw several pilots with wings laid out. Here I started sinking, panicked, and headed back to where I’d launched – but having lost height I couldn’t get back into the lift. So I resumed, this time gliding straight into the valley, annoyed at wasting my height. Spotting a cliff to my right I changed my mind again, making a right angle turn, and being relieved to find lift on the shady cliffs, even if the Verbier pilots (including tandems) were now above me. Gaining a few precious metres there (nothing more than a couple of hundred), I pushed on for the next cliffs which faced the sun – the stratocumulus was gradually starting to clear. Based on my experience with the flight so far I was unsure about what to expect. So it was absolutely incredible to meet there my favourite thermal of the whole xalps. A sunny rocky spine in the lee of the flow from the Rhone on an unstable day – it was just classic, it packed one hell of a punch, and it really livened up my day. Topping out only a few hundred metres higher I flew to the next sharp spine which initially I thought I might be able to soar the wind coming from the Rhone. Arriving I was propelled upward at an unnatural rate, only to drop at a similar rate on my very next pass. Something strange was going on. I turned tailwind and not long afterwards I went completely weightless for a couple of seconds. The wing was still open overhead but I’d been given a warning – this was a dangerous place. Keeping plenty of ground clearance over the trees I scooted around to the sunny faces away from this junction of air masses. For the next few minutes I was still a little cautious given I hadn’t completely understood this situation or at least it was completely unfamiliar (free fall in a paraglider!?). But soon I was back on track, it was still strong leeside conditions, but at least it made sense. I flew up the peak and made a crossing over Lac de Champex, the Canada of Switzerland. Arriving apparently too low to the spur to connect to the good clouds above, I had to drop downwind and soar for a while before sneaking up the valley to the thermals. I would have liked to take a shortcut through the Fenetre d’Arpette, the high col which I’d flown through last year in the opposite direction from the Tour Glacier. But I couldn’t get the height. I had to go around the front to the less glamourous rolling grassy fields. Here I landed to check the map and wait for the next thermal. I walked five minutes up to the ridge to have a look and make sure I got the next bit right. Overall I probably spent slightly too long on the ground but when I took off again I quickly found a good thermal and soon I was flying high jagged cliffs with just one crossing needed to get me into the Chamonix valley. One critical crossing. Even without the strong meteo wind from the west, it would be howling over the Col de Balme, Manual (GER4) later said it was so strong he was walking with a steep forwards lean and I think 60km/h may have been mentioned. Converse to what the public often ask (“you need wind to fly, right?”), wind is the enemy and war is deception. So into the high peaks to a likely spot and voila, a very rewarding climb in the lee to get me from just below to just above ridge height and I made the crucial move, entering the Chamonix valley. Stunning views of the long glaciers leading deep into the Mont Blanc massif were enjoyed as I pushed down the valley in occasionally boisterous conditions high in the mountains. Before reaching the Mont Blanc airspace I crossed the valley and crabbed along over dozens of day walkers on the Balcon Nord / Tour Mont Blanc. Some delicate soaring and I gradually rose up over several roped climbing parties, a steep valley wind facing cliff being my passport to the Aiguilles Rouges. This southeast range is most definitely a morning place, so at the first opportunity I crossed to the other side. 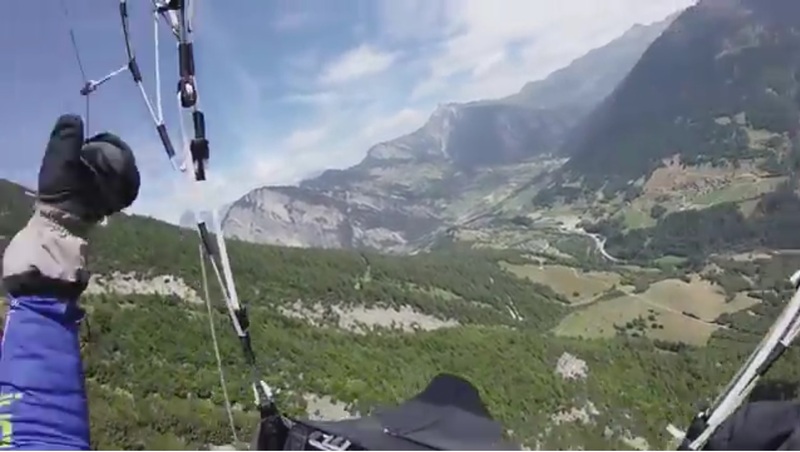 At cloud base I could fly very fast in a nice straight line towards the Chaine des Aravis, passing the enormous cliffs behind Passy and sharing the air with a distant hang glider pilot. From here I saw low ridges and wind in front of me and decided to take a route to the north. Once I’d pushed into the valley wind I’d enjoy a good run of soaring ridges all the way to the Annecy turn point. On the first attempt I wasn’t going to make it the headwind glide over the ridge though so I had to abandon fast flying just for a few minutes, turning back for a valley wind convergence climb. A last climb to make sure of it and I was gliding in fast for turn point 9, Planfait launch. There was a breezy crosswind which I think actually made landing easier but it was still quite lift and it took me three attempts until I was satisfied, not wanting to mush it in. I’ve seen some horrible xalps footage before (not as embarrassing as PWC launches but still very sloppy) and with the camera crew there I didn’t want to become part of that! Luckily they edited out my stumble after a quite reasonable landing and my launch was also good. Annecy looked spectactular as usual as I soared up the amazing limestone cliffs, the “teeth of the dragon”. It really is a paradise for free flight. No time to linger though as Louis, at turn point 9 fifteen minutes before me, had given me directions that gave me no cause for argument – head deep into the mountains. I’ve got a reasonable grasp of the French Alps but I began to head into less familiar territory. Finally I stayed high and stayed in the air and after 8pm it was actually light katabatic where I landed, just a couple of hours walk from Col de Madeleine, north of St Jean de Maurienne. With the winding roads giving me a headstart I arrived at the Col well before Louis, using my raincoat as a makeshift blanket. By the time the camera crew arrived I was fast asleep. The plan was to take a long glide into the valley from first light (6am) and then climb up the other side to fly as the day heated up. The same film crew who had encouraged me along when I was coming dead last was now following me for managing to get back into the top ten. After a long glide I had around ten kilometres of walking up the valley before ascending towards the Col de Galibier. I was aiming for eastern faces but it turned out to be a hot, stable, day, so Ferdy (NED) had a distinct advantage being much higher up the hill, despite being only three kilometers away. I tried really hard to break through the inversion around the cliffs near launch but after giving it a good go I started sliding up the valley following the light valley breeze. Still I could not break through. Louis informed me that Ferdy had climbed up to 4000 metres and I was slightly over half his height, struggling. My hopes of getting within striking distance of Monaco that day were fading fast. I think I was flying really well but I decided that I needed to break through too so I slope landed and hiked up the hill. A couple of hours later and I launched, starting to sink out, and spotted Manual (GER4) climbing on the cliffs just a kilometer from where I’d landed before. I’d been cheated! I went over to join him, arriving underneath but within earshot. He flew well and I meanwhile hated the light conditions (although the scenery flying the cliffs with the vultures was superb), so within the hour he had disappeared ahead of me and I was quite upset and unsure of myself. I rang Louis a number of times and to his credit he told me basically just to figure it out myself. Crossing the valley between Col du Galibier and Briancon I had a few tense moments before I could soar the strong (30km/h +) northerly back up into the mountains. I then spent some time drifting around the high glaciers on the northeastern edge of the Ecrins, with an eye on the gorgeous cumulus clouds high above. At least it was a therapeutic remedy to what would have been a humiliating landing in the valley. Circumnavigating the mountain to the sunny side I did connect to the high clouds, late in the afternoon but better late than never. 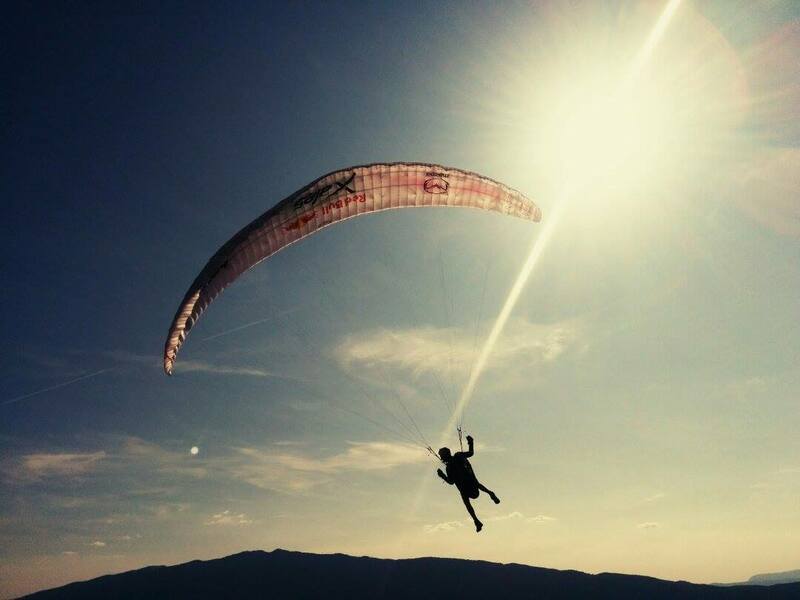 Happiness had returned amongst the amazing scenery of the Ecrins that I’d been dreaming about flying for a while. Following the clouds south I had a brilliant run, deep in the mountains following the convergences of all the long valleys. I’d make it out the other side too, to the familiar Serre Poncon lake. Here I had two choices – push south onto the Murgon, or float tailwind with the valley wind flow to the hill behind Embrun. Really I needed another climb to make Murgon work but I tried it anyway. Unfortunately I made life difficult, getting washed over forested ridges and having to tuck in deep to survive. It was very late, the valley breeze was still very strong but the thermals were dying. 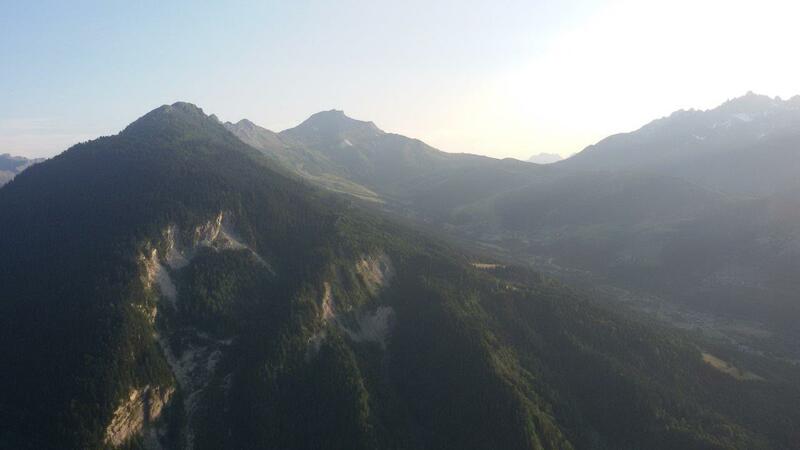 I just made it to the Embrun option but the slope was too shallow for me to soar up to the hill behind and I dived off again to end up landing in the shade in a small clearing where it had completely shut down. I managed to get most of it out but it was over an hour before my supporters could reach me and finish the job. We had a meal, regrouped, and decided that I’d have a little sleep in. A casual start at long last and didn’t that get some attention! The relatives especially were apparently egging me on to get out of bed, or assuming that there was some kind of Live Tracking mistake. I reassured them with a message, “It’s more about where you land than when you take off”, and started walking up to the Papillon, as recommended by Jeremie the sailplane pilot who had shown us the area the month before. It was another hot day (of course) but it turned about to be a lot more unstable than the previous day, so in retrospect I could have benefitted from an earlier start. But all my immediate competitors had night passes so there was no way I could beat Manual (GER4, who started near me but took a more standard line while I went east), Ferdy (NED, he finished that morning after walking non-stop through the night) or Gavin (USA2, he finished that afternoon after using his second night pass) unless I flew all the way and landed very close to Monaco, and they didn’t. As Honza (USA1) later commented, “you can’t brute force your way through the race, you have to think your way through”. 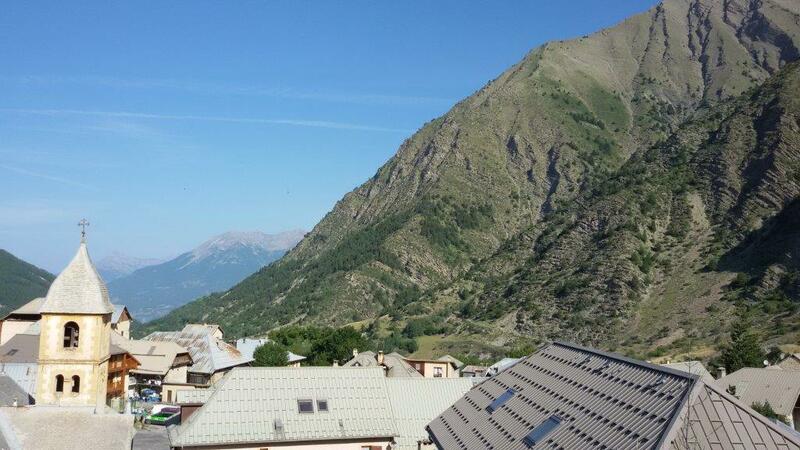 I took off straight into booming 5 metre per second climbs in the typically dry arid Southern French Alps. A good run down the familiar Tinee valley and wanting to avoid the valley winds I eyed up the remote rocky mountains on the Italian border. They were great but soon enough I reached the maritime airmass with a corresponding drop in altitude, and what’s more, high cloud crept in front of the sun. I landed high hoping the high cloud would drift away. 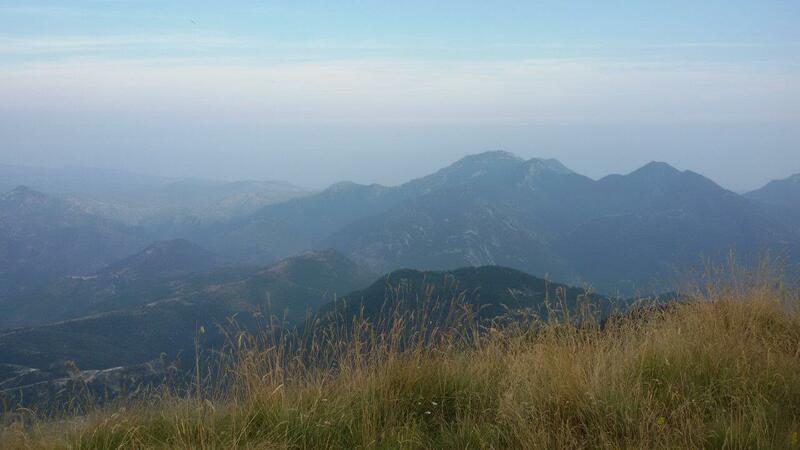 There was one last ridge to cross and then a valley led to Sospel which was within striking distance of Monaco. I could have glided over to a doubtful landing in the scrub and bashed my way through the bush but in the end it would not have been any faster than waiting, as I did, and flying again. Even though the lift was weak I still made the crossing landing approximately at launch height for a quick walk to the next saddle. Flying down the next valley I started at the limit of airspace and unfortunately had to loose 50 metres of height and avoid climbs to stay underneath it. Then I was too low to get back up again in the dimmed late afternoon sun, so to avoid a gorge below I face landed and quickly packed up. A swarm of flies followed me for several kilometres, as if I was moments from dying. 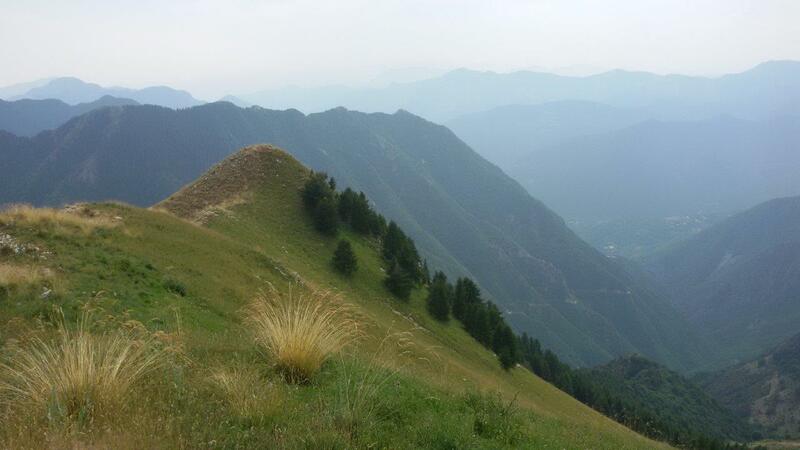 Finally I reached the grassy hill from where I could fly down past Sospel. In the direction of Monaco I saw a maze of rocky hills, but there were occasional landings scattered around if you are an optimist. Surprisingly there was no seabreeze whatsoever but instead a northerly blowing which helped me launch. I took a long glide, updating my landing choice whenever I saw I’d have the height to go a little further. Landing below a pass I packed up as fast as I could and got walking. It was now after 8pm and with another flight I had a chance of making Monaco that night. Manual (GER4) had crash landed in trees some distance from launch and his tracking had stopped working but with his night pass activated we thought he would probably reach Monaco during the night. Unsurprisingly, there were no more launch possibilities to be seen. Unfortunately Monaco was just out of reach. Feeling in top physical condition I ran down some tracks using every minute of the day. At 10:28pm running along with the head lamp I suddenly stopped, only a few hundred metres away from my intended camp. The hillside had dropped away! I looked around but it seemed impossible to cross even for a mountain goat. Retracing my steps luckily I found an alternate track just twenty metres back, and I ran past a stream and to my stopping point in time for the 10:30pm curfew. My supporters meanwhile had to drive for nearly half an hour around the winding roads to get to me after expecting to meet me one kilometre behind where I’d left the road. We set up for our final camp before Monaco. 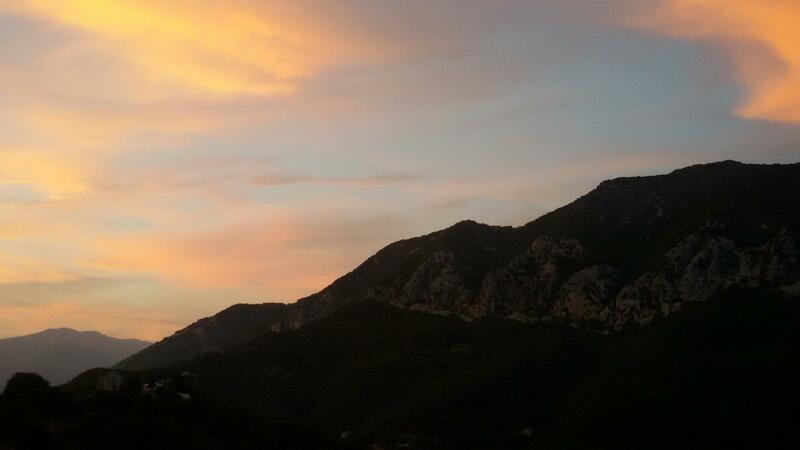 As I had enjoyed the sunset, I enjoyed the sunrise, wandering through the rocky hills over Monaco and the Mediterranean sea. It was nice to get a hello on the road from the race director and safety director, before getting lost at the golf course within a kilometre of goal. Finally I romped in, Louis handing me the infamous jandals although I insisted that the (perhaps embarrassing) 12 euro runners get their share of the attention. A small crowd greeted me but slumbering Ferdy offered his congratulations in his underpants not long afterwards. Dan and Louis had thought of everything – they handed me a bottle of cold bubbly beer – and we enjoyed the cool of the sunrise before the heat of the day. Arriving in Monaco is a very aesthetic way to complete things and I would hate to have to drive there from the mountains but of course there was some mixed feelings at having finished – I had been having so much fun. Next it was time for the ceremonial flight down to the raft, and the main thing on my mind was trying to avoid exposing my gear to salt water! What was really great though was all the enthusiastic support from our followers, and a great feeling amongst the team for having come back from the dead after the early elimination days and having put in a good show. The organisation were a pleasure to work with and after the ceremonial landing on the rescue boat (the what? ), they put on a great after party. The heat, which I’d somehow managed fine with during the race, was almost unbearable. Picking up my girlfriend I had an appreciation for my supporters and how much of a mission it is to get anywhere on these roads. I hoped I could persuade her to come to Mont Blanc to get as high as possible, rather than the GR20 route in touristy Corsica. I felt good (seeing the limping athletes around I was glad to have been spared a long march to Monaco) but gradually the tiredness began to set in – I needed to catch up on some sleep. A few tandems in Annecy (for my girlfriend, and my drivers fiancé), were all the flying I had for the rest of my time in Europe. The weather stayed hot and the flying potential was there but the climbing trip with Kamila was just brilliant and when back in Poland it was time to regroup and get ready for the next trip – South America. I’m then planning to train as a weather forecaster. Would I do xalps again? It was fun, so why not? The race itself was an amazing adventure and everything I’d hoped for but the real challenge is the preparation. Many people helped out but especially Louis my official supporter has dedicated months of his life to this event. I think it’s important to keep a balance in life and keep a perspective on why we do what we do. So rather than be fanatical about it, I’d just like to stay focused on having fun. 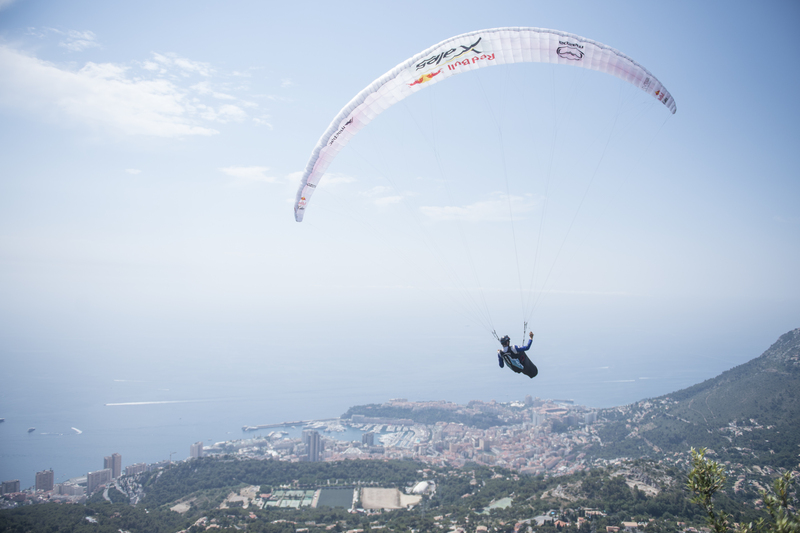 This entry was posted in Uncategorized and tagged adventure, europe, flying, paragliding, parapente, share my joys, xalps. Bookmark the permalink.